As with the last update, I’ve taken the opportunity to include a whole batch of songs that I’d worked on that never made onto this site as individual blog posts. So by my reckoning there are 39 new songs in here since the last edition, making a total of 152 songs in the new book. Eclectic as ever, that includes some synth classics, pop-punk by way of the 60s, a fair smattering of contemporary country-and-folk tinged songs, disco, and even a few contemporary pop hits. But more importantly just good songs (in my opinion, at least!). 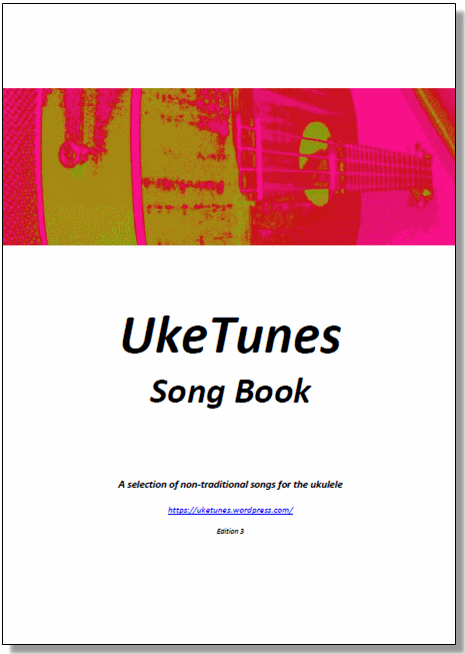 UkeTunes Songbook, Edition 3. This is the full song book, with all the songs in. UkeTunes 80s Songbook, Edition 3. An update to the previous edition, containing all of the 1980s songs that have been published here. UkeTunes 60s and 70s Songbook, Edition 2. An update to the previous edition, containing all of the 1960s and 1970s songs that have been published here. Categories: ukulele chords, Uncategorized | Tags: Songbook, ukulele | Permalink. When I published the last update to the UkeTunes songbook, there was a suggestion from Mike DiCamillo for a 1970s songbook to sit alongside the 1980s one. Seemed a good idea, so here it is. EXCEPT. I decided to extend it to a 60s and 70s songbook – it seemed to feel like a logical thing to do, and I think those songs sit well together. So here’s a collection of over 40 songs from that period, running the full gamut from crooning to punk, with a bit of reggae, psychedelia, country, soul, pop and rock along the way. As ever, please feel free to onward share and use as you wish. Categories: Uncategorized | Tags: Songbook | Permalink.